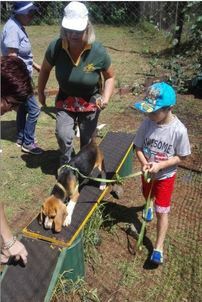 We are delighted to announce the next shelter coming aboard in the Canine Behaviour Shelter Course and this time it will be hosted at Langebaan Animal Care in Langebaan. 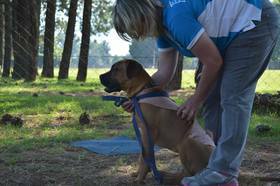 These courses are the first of its kind in SA and will provide an excellent foundation for anybody working in shelters or considering doing so. 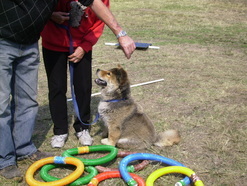 The Theory is done over a 6 month period and consists of both practical and theoretical sessions and presented by professionals in the canine field. There will be 6 Practical session. (click here for full CV). These courses are aimed at providing education to those involved in shelters such as Volunteers - people walking shelter dogs - people looking at working or volunteering in a shelter - or for people that just want to know about dogs in general. The knowledge and the tools provided will improve the life of the dogs in shelters and as dogs will be better behaved, the chances of them being adopted will be improved. Students will also learn the tools to supply knowledge to new owners with all the basic information they will need to get off to a good start with the new addition to the family. Students will receive certification on successful completion of the course which will be made up of the practical and theoretical sections. Practical - you are looking at 6 sessions on Friday, Saturday, Sunday 27th, 28th, 29th October and Friday, Saturday, Sunday the 3rd, 4th and 5th November. These will be held from 9.30a.m. until approximately 2.30p.m. Theoretical - the course is presented on-line and is very user friendly. At the end of each section there are a few questions to answer relating to the section you have just completed. At the end of each module there is a simple quiz based on the material you have just read. There is no research required or heavy assignments to complete. Theory opens in June 17 and you have 6 months to complete same. 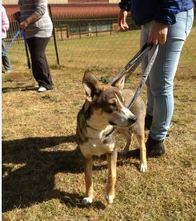 As this course is concentrated on dogs in shelters it will be offered at a special price, being R1800 which will be payable at R300 per month with no interest being charged – your initial payment will be a deposit of R300 to reserve your place and the balance of R1500 payable on a monthly basis of R300 from the end of the month following your deposit or by arrangement. Attendance will be limited to 10 participants (plus 2 from shelter) so that all participants receive the attention they deserve, so do book early to avoid disappointment. The practical sessions will be held from 9.30a.m. to approximately 2.30 - 3.30p.m. The 5F’s of Behaviour ; How dogs communicate ; Calming Signals Signs of stress - Further Notes - Signs of possible reactive behaviour ; Common reasons why dogs bite ; You Tube Video on dog attacking a person. Balance Lead, Super Balance Lead, On lead Recall, Free Walking, wait, and Down , Stand, Bite Inhibition, Leave Exercise, Changing Jumping Up, Swap Exercise. 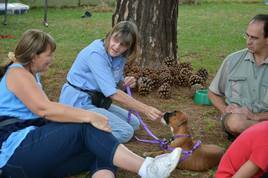 By working with their own dogs, participants can gain the necessary skills which will make working with the dogs in the shelter much easier. History : What TTouch is comprised of : Basic TTouches. Noah's March, Ear work, Llama, Tarantulus, Zig Zags, Chimp & Baby Chimp, Clouded Leopard, Abalone, Lying Leopard, Python Lifts, Mouth and Tail Work. 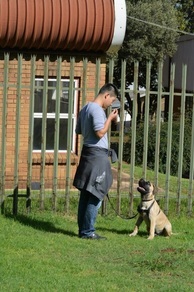 Not only does your own dog benefit from the TTouch, it gives you a chance to practice your new skills before working on dogs in the shelter. 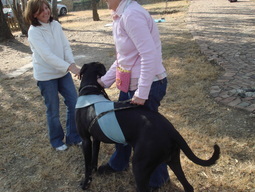 Safety, Calming Procedures - (calming dogs from outside the run ; calming dogs from inside the runs ; getting dogs to sit quietly and politely while collar and lead put on ; helping dogs to remain calm with exiting the run) Balance Lead, Super Balance Lead, On Lead Recall, Free Walking, Elements of TTouch brought in. Afternoon - Away from shelter. 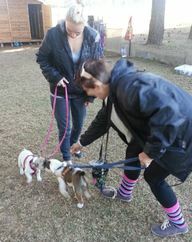 How to prevent Separation Anxiety in shelter and change same, desensitizing a dog to a muzzle, using a head halter for professional pullers. 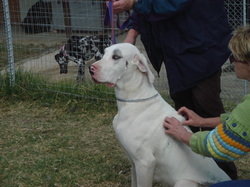 Putting together a session for new owners prior to dog going home, ongoing assistance, questions and answers in general. Dog Language : Can amputation of a tail affect a dogs behaviour and calming signals? : How humans can misunderstand dogs behaviour : How misconceptions could have arisen. Signs of potential problems and important factors to consider : Unbalanced Pups – how does this behaviour happen? Approaching strange dogs : In the case of a possible dog attack. : What is the best dog for kids? Definition of Separation Anxiety : How does this develop between dogs : How does this develop between people and dogs : How to resolve and prevent in the shelter environment ; Preventing Separation anxiety when dog goes to the new home : Signs that Separation anxiety may be developing. The shelters will be given additional theory sections such as Assessments, Working with Volunteers. 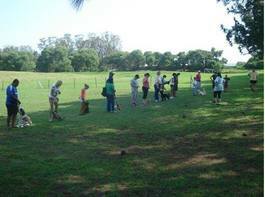 Various Questionnaires to assist in Matching Dogs and Owners and for Potential Adopters to complete.